A power hitter and an average infielder in college, Rich Dauer reversed his strengths in the major leagues, becoming a superb fielder with just average power. Dauer is best known as a sure-handed second baseman who set a major-league record with 86 consecutive errorless games and 425 consecutive errorless chances while with the Baltimore Orioles. He made his major-league debut on September 11, 1976, and played in 1,140 games over a ten-season career; he played his final game on September 29, 1985. He is one of a few select players who have won the World Series at both the college and major league levels. Further, he has participated in the major league World Series as both a player and a coach. Richard Fremont Dauer was born on July 27, 1952, in San Bernardino, California. He spent his childhood in the San Bernardino area. His parents were both in their 40s when he was born. He had a brother who was 16 years older and a sister who was 15 years older. As a teenager, Dauer was a three-sport athlete (baseball, basketball, and football) at Colton High School. The 6-foot infielder batted and threw right-handed. After graduating from high school in 1970 Dauer entered San Bernardino Valley Junior College. In January 1971 he was a fifth-round draft pick of the Oakland Athletics, but decided to stay in college and did not sign. The A’s drafted him again in January 1972, and again he chose to stay in school. After Dauer batted .503 in 1972, the Cleveland Indians chose him in the second round of the June draft, but for a third time Dauer did not sign, choosing instead to transfer to the University of Southern California, where he played on two consecutive national champions. This time the Orioles came calling, picking Dauer in the first round of the June 1974 draft (24th pick overall), and he was signed by Orioles scout Ray Poitevint. Dauer had been a star at the University of Southern California, leading the team in batting average in 1973 and ’74 and being named the team’s Most Valuable Player in 1974. USC won the College World Series in both years, and Dauer played an integral role both seasons. His USC teammates included future major leaguers Roy Smalley, Fred Lynn, and Steve Kemp. To cap off his senior season, Dauer was selected to the 1974 College World Series all-tournament team. He set an NCAA record in the opening game of the College World Series with a second-inning single. It was his 102nd hit of the season, breaking the record of 101 set by Arizona State’s Alan Bannister’s in 1972. Dauer ended the season with a total of 108 hits and a.387 batting average in USC’s 70 games. Besides hits he also set NCAA one-season records for runs batted in (92) and total bases (181), as well as USC records for home runs (15), doubles (24), and runs (70). Dauer’s 92 RBIs shattered the USC record of 67 set by Ron Fairly. Dauer struck out only 16 times in the 70 games. At the end of the season he was named a first-team All-American. In his two years at USC Dauer batted .376 in 126 games. He clubbed 26 home runs, drove in 135 runs, and scored 124. Dauer once drove in eight runs in a game, sparking the Trojans to a 12-1 victory over Pepperdine for the District 1 title in 1974. A week after being drafted, a soft-spoken Dauer told reporters that he was excited to come to Baltimore, and he commented on the Orioles’ future Hall of Fame third baseman, Brooks Robinson. “I hope he is getting old [Robinson was 37 at the time]. They are going to need a new third baseman soon, and I feel – and hope – I fit into their plans. … Brooks is steady afield to say the least, and at times spectacular. The scouts say my main selling points are my hitting and that I am steady, if not spectacular in the field.”2 But Baltimore had drafted USC’s third baseman with designs to move him to second base. The Orioles’ first-round pick was assigned directly to Double-A Asheville (Southern Association), and hit .328 for Asheville, with 11 home runs in 53 games. He struck out only 18 times. The next year, split between Asheville and Triple-A Rochester, his numbers were not as good (.242 overall), but in 1976 he batted.336 for Rochester with a league-leading 178 hits, and finished in a three-way tie with Mickey Klutts of Syracuse and Joe Lis of Toledo for the International League Most Valuable Player Award. “Making the [International League] All Star Team was my second big thrill of the season,”3 Dauer said after the season. “The first was getting in my 90 days in (Triple-A) for a $1,500 incentive bonus.” As if those weren’t thrills enough, Dauer was called up by the Orioles in September and made his major-league debut on the 11th, getting his first major-league hit in his first at-bat. A single between shortstop and third base, it came off Milwaukee Brewers right-hander Jim Colborn at Milwaukee County Stadium. After the impressive beginning, Dauer had a difficult introduction to the major leagues, going 4-for-39 with 3 RBIs. Despite that he earned a spot with the Orioles in 1977. In 1978, while playing second base in 87 games (he also played third base in 52 games), Dauer set the errorless-games and -chances records. The streak ended in the next-to-last game of the season, on a throw to first baseman Eddie Murray, who said after the game that he should have caught it. In 1979 Dauer batted .257 with a career-high nine home runs and 61 RBIs as the Orioles won the American League East Division championship, then subdued the California Angels for the pennant. The Pittsburgh Pirates took the World Series in seven games. In Game Seven Dauer’s third-inning home run gave Baltimore the early lead, but the Pirates came back to win the Series, 4-1. In 1980 Dauer had his best offensive season, batting .284 with 158 hits, smacking 32 doubles and driving in 63 runs, all career highs. More impressive was the fact that he led the American League in at-bats per strikeout with 29.3. All the while, his fielding was superb. 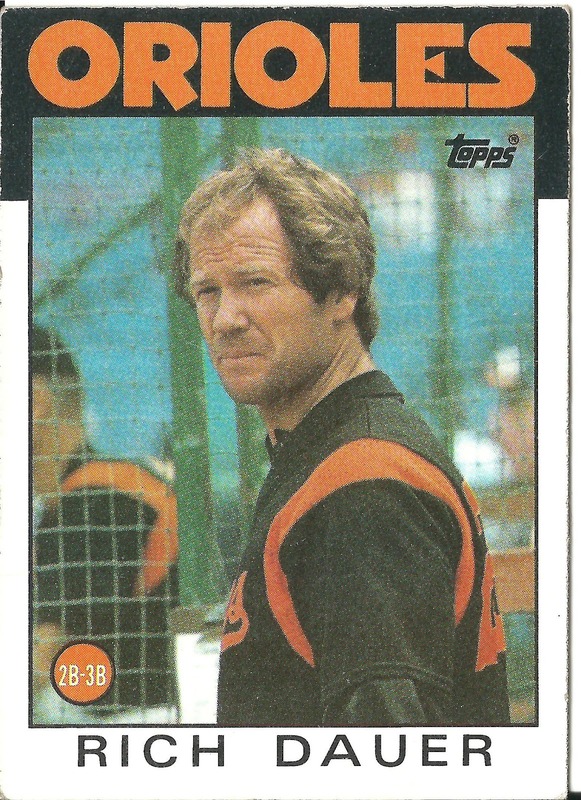 In January 1981, Dauer, a free agent, signed a five-year contract with the Orioles. By May 11 Baltimore was in second place, a game behind division-leading Cleveland. Their manager, future Hall of Famer Earl Weaver, told Sports Illustrated, “This is going to be the year Rich Dauer hits .300. He’s been here long enough to know that he doesn’t know all there is to know about what he should know.”4 The players’ strike resulted in a split season; the Orioles finished the first half in second place in the American League East and a disappointing fourth place in the second half. Dauer failed to fulfill his manager’s prophecy, finishing the season at .263. He had 27 doubles, fourth best in the league in the strike-shortened season, and his 20.5 at-bats per strikeout led in that category for the second consecutive year. Dauer hit two home runs in a game on August 24 in Seattle, the first time in his career he had accomplished the feat. “This is a nice small ballpark,” he remarked. “If I played here all year, I’ll bet I could hit five.”5 Defensively, Dauer put together a 76-game errorless streak during the season. The 1983 season was an offensive disaster for Dauer but it was magical for the Orioles, who won the pennant and defeated the Philadelphia Phillies in five games in the World Series. Dauer batted just .235 in 140 games, with only 19 doubles, 5 home runs, and 41 RBIs. He struck out only 29 times (third best in the league), but his defensive prowess kept the Orioles in the hunt for the championship. He made only seven errors at second base. Dauer managed to raise his batting average to .254 in 1984, but he was 31 years old and on the downslide. Still, one of Dauer’s goals was to play 1,000 games at second base so he would hold the record for the highest fielding percentage at the position. But the Orioles were keen to play Alan Wiggins at the position. They let Dauer go as a free agent at the end of the season, and he ended his career with 964 games at second base. At the end Dauer’s fielding continued to be impeccable, but the Orioles were looking for more offense at the position. From 2006 to 2008 Dauer was the Colorado Rockies’ minor-league infield coordinator. In 2009 he joined the Rockies’ big-league staff as the third-base coach. He held the job through 2012, and he was the team’s infield coach and coordinator of defensive positioning. In 2010 two Rockies players, Troy Tulowitzki and Carlos Gonzalez, were Gold Glove winners. Also in 2012, Dauer joined former Orioles ace Mike Mussina as the two were inducted in the Orioles Hall of Fame. That brought the total number of players from the World Championship 1983 team inducted into Baltimore’s Hall of Fame to a lucky thirteen. On December 12, 2012, Rich Dauer was named manager of the Padres’ Double-A San Antonio affiliate, following four seasons as a coach with the Rockies. After a 78 – 61 regular season, Dauer led the Missions to the Texas League Championship Series title, defeating the Arkansas Travelers, in his first year at the helm. Dauer married the former Chris King of San Bernardino on February 1, 1975, just before heading east for spring training. They had three children: Casey Lynn, Kelsey, and Katie. Back home in Colton, Rich Dauer Park was dedicated in honor of the major-league player and coach. “They Said It,” Sports Illustrated, May 11, 1981. Found online at http://quicktime.cnnsi.com/vault/topic/article/Rich_Dauer/. Accessed December 17, 2009.
http://www.baseball-reference.com/bullpen/Rich_Dauer. Accessed December 17, 2009.
http://colorado.rockies.mlb.com/team/coach_staff_bio.jsp. Accessed December 10, 2009.
http://www.usctrojans.com/sports/m-basebl/spec-rel/2010-mediaguide.html. Accessed March 8, 2010.
http://colorado.rockies.mlb.com/team/coach_staff_bio.jsp?c_id=col&coacho... =113070. Accessed May 3, 2011.
http://articles.baltimoresun.com/2012-08-24/sports/bal-rich-dauer-become.... Accessed September 14, 2013.
http://www.milb.com/news/article.jsp?ymd=20130915&content_id=60724120&fext =.jsp&vkey=recap&sid=t510. Accessed September 16, 2013. 1983 Baltimore Orioles Media Guide. Special thanks to Len Levin, Bill Nowlin, and Gabriel Schechter for assistance. 1 Rich Marazzi, “Rich Dauer,” Sports Collectors Digest, December 1, 2000. 2 Taken from unnamed newspaper clipping, dated June 16, 1974, in Richard Dauer’s player file at the A. Bartlett Giamatti Research Center, The National Baseball Hall of Fame & Museum, Cooperstown, New York. 3 Unidentified clipping, Dauer Hall of Fame player file. 4 Unidentified clipping, Dauer Hall of Fame player file. 5 Unidentified clipping, Dauer Hall of Fame player file. 6 Unidentified clipping, Dauer Hall of Fame player file.